Instagram is full of some of the greatest compilation of contemporary artists of the moment, many people are pouring Arts inspirations on the social media platforms such as Instagram, best of all it's free of charge to get these newly created inspirations from Artist around the World. Although they're not always pretty or perfect, these artists are giving you images that are both inspiring and eye-opening. 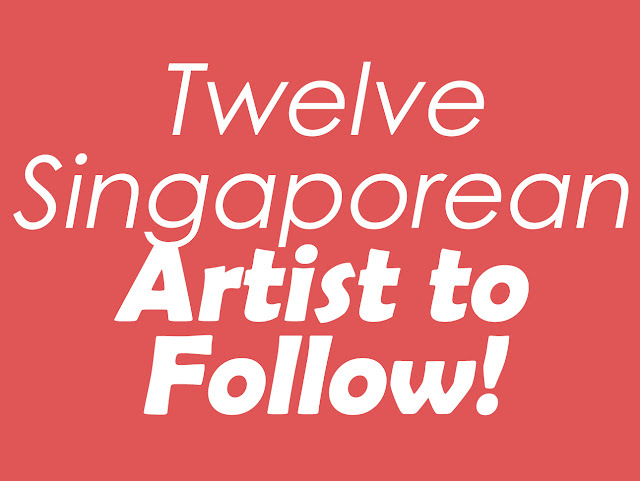 On behalf of Artfullysg, I'm sharing today, "12 Singaporean Artists You Need to Follow on Instagram". Artist Jiabei uses multiple geometric shapes element and creates her world of adventures and creatures within, her Artwork is usually outlined in black inks. Super love her skilful creative creation as well as her style within! Guess who finally had the foresight to label the paint water and drinking water. The Artist, Cherie applies a lot of hairline strokes in her drawings as well uniquely contrasty colour blend in her drawings. I especially love how she portrays her portraiture drawings, it is so different from the norm we usually see. Louise paints and she paints amazingly like a realist. The key is to paint something that looks real and beautifully it takes quite a skillset to do. Love, how she is able to do so! Oooh! Someone's looking sharp! Cacti-fy yourself today! 🌵 Get yours faster by dropping us a DM! 📩 - 💰Creative portraits are going for $15/face. Cut the queue at our art markets by ordering yours online! We just need a photo of a face to draw. Postage still applies. ⚠️Word limit: 4-5, because of the aesthetics we aim for. A joyful Instagrammer who draws very cheerful and creative towards humorously content. Her drawings are cute and most of them look like they are inspired locally. Such as drawings of shophouse, felines, and some of the fruit and food we have in our daily life locally. Kow Fong is well-known within Artist in Singapore. His drawing had reached out to some stationeries stores such as Popular Bookstore and NBC, he does amazing drawings of mixed Singapore and his very own dreamland with a boy or a girl in it. He sells them in forms of Calendar, Postcards, Ring file, Notepads & etc. By seeing his drawings, the similarity concept reminds me of my favourite illustration idol who is famous Jimmy Liao. Chelsy's Instagram Gallery shows very clearly of her unique colouring style, her drawing style is uniquely camouflaging yet not really messy in some of her paintings. She also does beautiful portraitures drawings. I especially love her drawing style, that includes how cute she could make any human portraits to be in her drawing. Her drawings are very cool, cute, simple and straightforward. I also love how she applies her highlights and shadowing on her drawing. Artist Shi Peng is a realist in sketch, at times he also adds elements from his own fantasy into the drawing. The outcome are usually pretty impressive. My favourite part about his drawings is how he applies his lighting and shadow in his artwork so well that it looks almost like a 3d person infront of you, but nope it is a portraiture drawing. Ruyi's Artwork seems to be a lot representing her very own feelings and expression of her mindset as well as the things she mesmerize. She expressed well in each of her artwork in her Gallery. In this Instagram Gallery, has potential Floral Arts painting which is buy-able from her as written in some of her ig post. She does mainly acrylic, watercolour and fondant painting that looks awesomely beautiful. Pingisme, draws random doodles which usually look quite different from each and every artwork. She also does Calligraphy paintings at times, check out her Gallery and you will see multiple varieties of her artwork..! Thanks for reading up my blog and by chance if you know any talented Artist, feel free to recommend them to ARTFULLYSG for Interviews / Features!